Mediterranean Flatbreads with Roasted Tomatoes & Scallion Cashew "Cheese"
with Roasted Tomatoes & Scallion Cashew "Cheese"
For full ingredient list, see Nutrition. Preheat the oven to 425°F. Mince the garlic and add to a small bowl with 1 tbsp olive oil and a pinch of salt. Mix the garlic oil to combine. Trim just the bottoms away from the asparagus and cut the remaining stalks into 2-inch pieces. Slice the zucchini into rounds about ¾ inch thick. Transfer the trimmed asparagus stalks and sliced zucchini to a baking sheet and toss with 2 tsp olive oil and a pinch of salt and pepper. Roast until just tender, about 7 to 10 minutes. Roughly chop the romaine. Add the lettuce to a medium bowl and toss with red wine vinegar, 1 tsp olive oil, and a pinch of salt and pepper. Roughly chop the roasted red tomatoes. Place the flatbread in the oven directly on the rack. Bake until slightly crispy, about 4 to 6 minutes. Once the flatbreads are toasted, use a brush or your fingers to spread on the garlic oil. 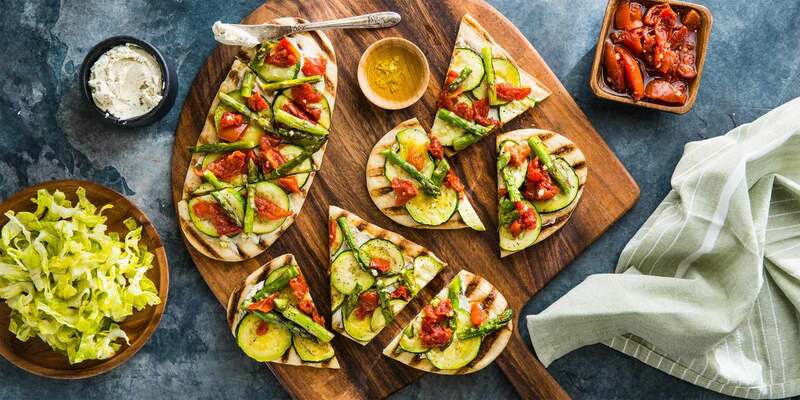 Layer on the roasted asparagus and zucchini, chopped roasted red tomatoes, and dollop with spoonfuls of the scallion cashew cheese. Sprinkle with salt and pop flatbreads in the oven until the cheese is warm and softened, about 2 to 4 minutes. Remove the Mediterranean flatbreads from the oven and slice. Serve with the romaine salad.